When summer rolls around, and the sniffles and coughs have subsided, we will take our boy on his wish trip to San Francisco. He has wished to hear a performance by the San Francisco Opera, go on a boat with a fog horn, see sea lions, go to the Monterey Bay Aquarium, and visit the ocean as much as he can. 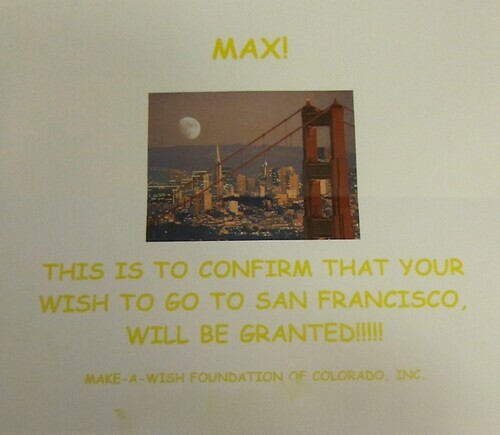 We had initially thought of going to Hawaii, but once we started thinking about all the things Max loves, that was close enough to travel with him, we knew his wish trip needed to be in San Francisco. And, since this trip is all about him, and his loves, that's what we requested for him. There will always be Hawaii for us to enjoy another time. But, we are excited to go as a family on such a special trip together. And to take Max on a trip that will be catered to him and will be made accessible for him to enjoy all the things he loves in San Francisco. What great news! It sounds like the perfect trip! !